Beaver Valley Foot Clinic knows all too well the winter months are especially harsh on our feet due to cold and damp snowy conditions. The elderly and diabetic most at risk due to circulatory issues, but there are steps everyone can take to prevent foot injury during this winter season. A good pair of kids boots can be expensive. Sometimes when buying boots for our children we consider a size bigger hoping to get two seasons out of them. This is a big no-no in foot care. Boots and ice-skates should fit snug with a pair of warm socks so the heel and ankles are immobilized, while the toes have room to wiggle. Properly fitted winter footwear will prevent blisters and chafing and put your children less at risk for ankle and foot injury. 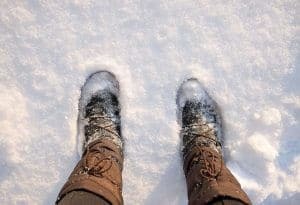 Protecting your feet from the winter elements are especially important for those who are aging or diabetic because they have poor circulation. Though traditional slippers keep your feet warm, they offer very poor arch and ankle support which leaves you at risk for slipping and falling. Instead, purchase a high quality light-weight shoe that has less than a ½ inch sole, supports the arch of your foot, and has no heel. Don’t forget to wear with comfortable socks. Just because the winter arrives doesn’t mean you have to throw in the towel on outdoor activities. If you are an avid runner, take your time and make smaller strides to stabilize your balance and prevent slip and fall injuries. Snowboarders and skiers should always choose supportive snow and ski boots. Tight around the ankles and heels with room to wiggle the toes. Wear the right clothing, drink a lot of water and ALWAYS stretch before any activity as the winter causes our muscles and tendons to stiffen up. And always remember to visit Beaver Valley Foot Clinic for all of your cold weather foot care services.